We can supply a wide variety of scissor tables for a wide variety of applications. Our scissor tables come in a verity of formats, including hydraulic, hand crank and stainless stee. Hydraulic lifting table. The table is equipped with a quick lift. The raising is easily adjusted with a foot pump and the lowering with a manual control. Two fixed wheels and two castors. Foot protection on the castors. Manual lifting table the height of which is adjusted with a crank. Two fixed wheels and two castors. Foot protection on the castors. Hydraulic lifting table! The table are equipped with a quick lift. The raising is easily adjusted with a foot pump and the lowering with a manual control. Two fixed wheels and two castors. Foot protection on the castors. Hydraulic lifting table with double scissors. Equipped with a quick lift. The raising is easily adjusted with a foot pump and the lowering with a manual control. Two fixed wheels and two castors. Foot protection on the castors. Hydraulic lifting table. The table are equipped with a quick lift. The raising is easily adjusted with a foot pump and the lowering with a manual control. Two fixed wheels and two castors. Foot protection on the castors. Manual portable lifting table. Height is adjusted with a foot pump. The table is lowered with a manual control. Two fixed wheels and two castors. Foot protection on the castors. Equipped with a quick lift. 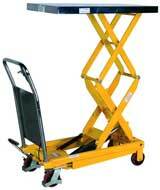 Foot hydraulic stainless steel 304 grade mobile scissor lift table.